This sweet as nectar cake is sure to please everyone! Stir in vanilla, pineapple, 1 cup pecans, and bananas. Pour batter evenly into three greased and floured 9-inch round cakepans. Cool in pans on wire racks 10 minutes; remove from pans, and cool completely on wire racks. Be careful as these can stick to the pans. 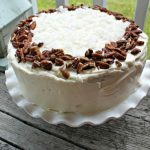 Decorate with chopped pecans and more coconut on top.